Blants Natural Pure Borax is authentic, harvested from deep Mediterranean deposits, and free from added fragrances and flow agents. It has been thoroughly researched and analysed to ensure it is pure, is not tested on animals, and has many benefits & uses. 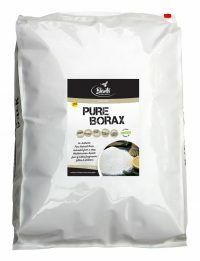 Borax is an effective environmentally friendly alternative to harsh chemicals. You can use it in numerous ways around your home. To soften and freshen laundry – add ½ a cup to your load and use less washing powder. 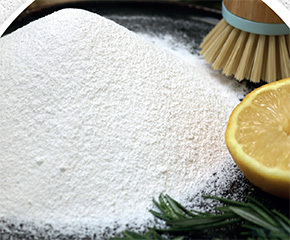 As an all-purpose cleaner – mix 2 teaspoons of borax with 2 cups of hot water and shake to blend. Keep it in a spray bottle to clean surfaces. 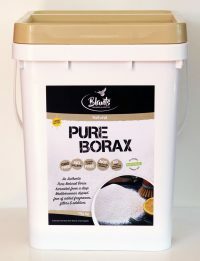 Make toilet cleaning easier – distribute a cup of borax into the bowl at night. Next morning the grime will be loosened and ready to remove with the toilet brush. Clean – bathtubs and sinks with a paste made from a cup of borax and ¼ cup lemon juice. As an insecticide – sprinkle borax on dog beds, carpets and areas where you suspect fleas, cockroaches and ants. Inhibit mould growth – by applying a thick paste of borax and water. Once it’s dry, sweep away and rinse. Great for unclogging drains – use 1/2 cup of borax followed by 2 cups of boiling water, let it sit for 15 min. These uses alone are enough to merit Borax as an ideal substitute to harmful chemicals, which can cause havoc with our health and to the environment. *There is a stark parallel with the relationship of soil mineral deficiency (plants soil) and the human body. Boron, the active ingredient of Borax, is an essential trace element for plants. A plant deficient in boron is not a happy healthy plant. Many people report feeling supple, refreshed and invigorated after soaking in one of the many Hot Mineral Springs that exist around the world. Those springs contain an array of minerals, and one of those minerals is Boron. Similar sensations can be experienced if Borax is added to a bath soak. Perhaps add a little Borax to an Epsom salt or Magnesium Chloride bath, for a super comforting soak. No set amount to use per soak, but as a guide – Add 50-300grms of Borax per bath. For a foot soak add a tablespoon per soak. 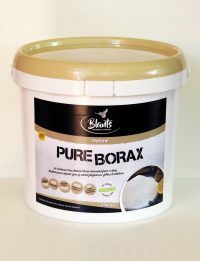 Pure Natural Borax online in NZ in 900g, 4.5kg, 10kg, 20kg. If you’d like to buy bulk wholesale Borax, please contact us. 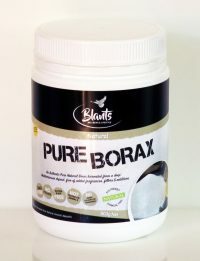 Thanks for visiting our Borax page. You might also be interested in our Washing Soda, or Sodium Bicarbonate.